could you please tell me how to determine if the construction of a shaitel is well made? i recently saw a shaitel that looked nice on but felt a little bit too light to me. i have a lot of hair, so some wigs that are thinner feel cheap to me, but the shaitel macher was trying to convince me this is a good thing. so the construction of her wigs was basically a horizontal line of hair, an inch-or two of space and another line of hair. is that normal?? my shevy is not like that at all, it seems to be just hair coming from every point of the cap, there aren't any "lines" or "spaces"
is that the reason shevy is so expensive? more hair? is that the reason my shevy knots so much? what should i do, im afraid of buying a shaitel that doesn't feel full, it makes me doubt how long it will last..
your insight will be greatly appreciated ! Thank you for your questions. First, let me explain about the two types of cap construction. It sounds like your Shevy is "handtied" which means the hairs are not sewn into rows (or wefts) but rather individually weaved throughout the holes of the cap. 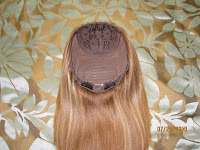 This cap construction is usually considered "better" because these caps are stretchier and more comfortable and the hairs can be placed in individual directions. Here is a picture of a handtied wig from a Shevy review I wrote earlier this year. They are also usually custom sewn to fit your exact head shape. The sheitel she was showing you was "wefted" which means its construction consists of various wefts of hair (pictured on left) that are sewn in rows usually a few centimeters apart. The tops of these wigs usually have a "hand tied" section that allows the sheitel to have a multidirectional skin top. There are two types of wefts: open and closed. I have owned both types (my Milanos were open wefts and my Freeda and JAP fall had closed wefts. Both have their advantages (I was able to itch my head in between an open weft before). However, it is possible that if a open wefted sheitel is thin enough that ones real hair could actually show through. This would only happen in rare cases though. Wefted does not necessarily mean thinner. I have owned very thick wefted wigs. It sounds like the particular piece you were shown is thin. My JAP fall was wefted and very thin( please refer to my JAP Review). The advantage to the thinness was that the wig was light and therefore more comfortable (I could barely feel it on my head). However if you like the look of really thick hair, then a thicker, heavier sheitel would be more appropriate for you. Another disadvantage to wefted wigs is that the hairs have to be sewn in one direction (which is usually down). The problem is that since the hair is headed downward it would look less natural if one tried to pull it into a low pony and could actually be hard to pull into a twist or high pony. Pony Sheitels are actually made so that the wefts on the bottom of the sheitel are heading upward so it would make a more natural pony. I have some friends who wear their pony sheitels down without problems. Also, when a sheitel macher washes an open wefted wig they often have to flip sections of wefted hair that may have become twisted through normal wear. One who is not careful about untwisting sections could cause more problems. The reason your Shevy was so expensive is because it was handsewn, versus wefted wigs which are machine sewn. Secondly, you were paying for Shevy customer service, which usually means that they will fix any problems that arise naturally within a reasonable amount of time. Also, Shevy supposedly uses unprocessed European Hair (this is not confirmed) but they at least have more quality assurance in terms of picking "good hair" that is shiny, soft and silky. They have a reputation to uphold in a very competitive market. I think there are great wefted wigs available that are good quality. For example, even the Shuly wig reviewed on my site is made of closed wefts, as is my Freeda. Since wefted wigs are machine sewn, they are arguably more durable in the long run. Also, a handtied wig requires much more care and attention when being washed. It is absolutely vital that it is washed by a trained professional or that the owner receives guidance from the manufacturer on how to properly wash and set it. If the wefts of hair are sewn in properly (cuticle in the same direction) there should be minimal knotting. 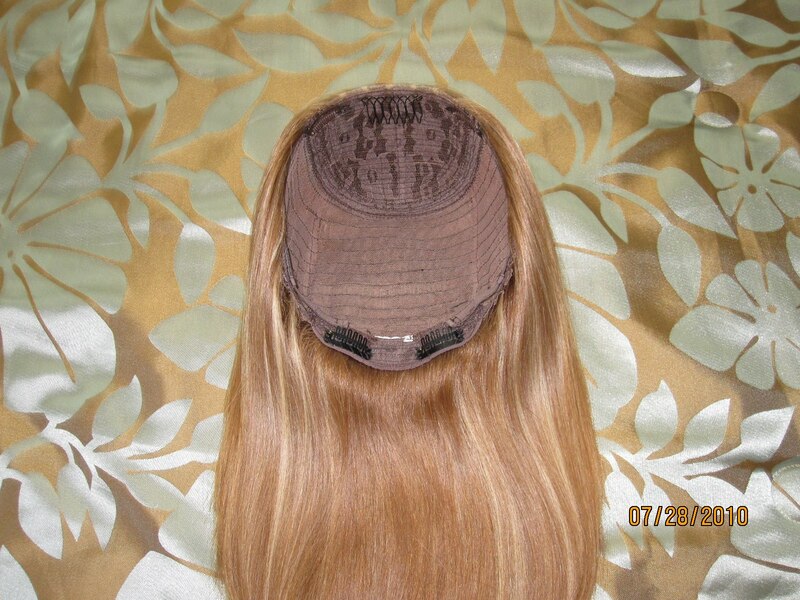 It is possible that the hand tied cap could be causing the Shevy knotting, as knotting is the most common complaint with Shevys, but it could also attributed to some other cause perhaps the hair texture. Keep in mind that custom handtied wigs are usually $3000-4000 and a "out of box" machine sewn "custom" usually runs for about $1500-2500 if it is made of European Hair. My advice, look for a thicker wefted sheitel (they do exist!). Also, make sure there is some kind of guarantee in case the wig you buy ends up being defective. In terms of hand tied wigs lasting longer... usually its the skin tops that thin first, necessitating the need for a new wig, not the back part that is wefted. Handtied vs. machine shouldn't affect the life of the sheitel since they both have multiirectional skin tops. FYI hair can be added to a thinning skin top to extend its life. As I read this I couldn't help but want to add. I have a custom, long, curly fall and it is wefted. The woman who made it for me suggested that as a first wig I go for wefted. My own hair had never peeped through, and I must say I like the fact that I can scratch my scalp if the urge hits me. I would complain that this fall always ends up in knots, however I believe that it has more to do with the length and curl than the stitching of the hair. I have since purchased a custom hand tied full sheitel (thank you Chavi on your advice for that one), which is very very comfortable. Do you know if anyone sell hand tied sheitels out of a box, or are they only available through custom orders?